The Maldives Judicial Academy has conducted the first edition of its Annual Lecture Series 2016 tonight, at the Conference Hall of the Islamic University of Maldives. The inaugural edition of the Series was conducted in collaboration with the Islamic University of Maldives. Tonight’s Lecture, under the title Types of Employment and the Common Law Remedies: A Comparative Approach was delivered by Professor Doctor Ashgar Ali bin Ali Muhammad, an expert from the International Islamic University Malaysia (IIUM). The program was designed to feature a ninety-minute lecture, followed by an hour of questions and answers. In his coverage of the topic, the Lecturer discussed the different types of employment and remedies provided by the English Common Law for dismissal of employees on wrongful, unfair, or unjustifiable grounds. Professor Doctor Ashgar Ali has been teaching at the IIUM since 2012, having completed his legal education in Malaysia and New Zealand. He has authored a number of books on law, and published many articles in academic journals. He has also presented papers in various international conferences. Tonight’s lecture was attended by Justices of the High Court of Maldives and Judges from the Criminal Court, the Civil Court, the Family Court, the Juvenile Court, and the Drug Court, in addition to some Magistrates. 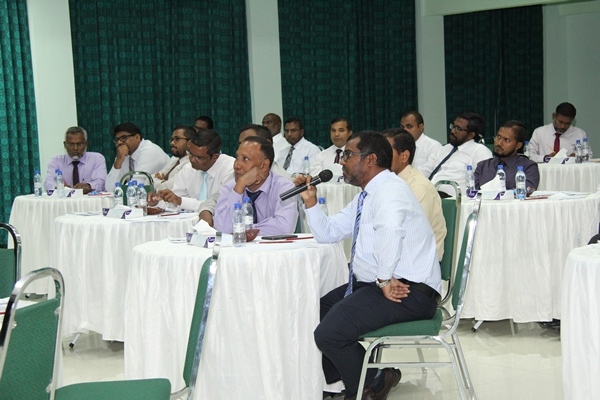 MJA Annual Lecture Series is one of the many programs of continuing judicial education and training to be conducted by the Maldives Judicial Academy. Four lectures are planned for every year, and each would be delivered by an expert or academician of note, on topics relevant and important for the Maldivian judicial and legal sector.